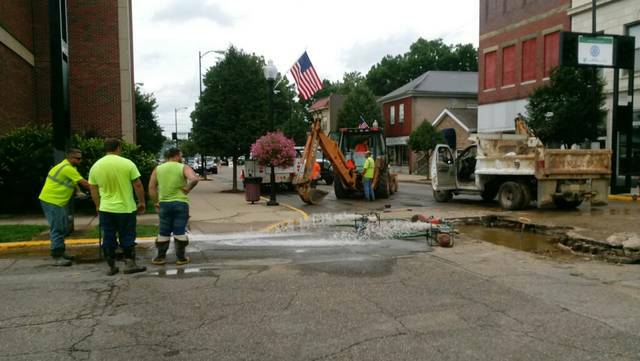 City workers took on the task of repairing a water main on Chillicothe Street Tuesday. Pumps work to empty was from the hole city workers dug to repair a water main break on Chillicothe St., Tuesday. For the first time in over a month, the city reported yet another water main break, this time in the area of Chillicothe and Second streets. However, acting City Manager Sam Sutherland, who is also Portsmouth Water Works Director, said the break was an isolated incident and he does not foresee a recurrence of the spate of water breaks that plagued Portsmouth in June and July. Sutherland said the city received a report early Tuesday morning there was water bubbling out of the roadway on Chillicothe St. The city investigated and indeed found a break in the six-inch line beneath the street. Sutherland specifically stated the break was not related to the ongoing $4.5 million project to replace or upgrade water mains leading to the city reservoir on Sunrise Avenue. Sutherland and Acting Mayor Kevin Johnson both have said that work inadvertently led to the many water breaks over the summer. The city did not issue any boil orders because of the incident which Sutherland assumed would be fixed late Tuesday afternoon. He stated he could not say with certainty what caused the break, adding only that the line involved was an old main. The break may have been the result of a weak spot simply giving away. One report said the situation was aggravated by the fact city workers were unable to turn off aged shut-off valves in the area. Sutherland said he could neither confirm nor deny that report but added it was not out of the realm of possibility. Talking about the reservoir project last month, Johnson said the city is not replacing the 30-inch diameter line running to the reservoir. Instead, using new technology, contractors are pumping a new liner inside the pipe. Johnson said putting in a new liner instead of new pipe is considerably cheaper and far more efficient. For example, the city does not need to tear up streets anywhere near as much as they would have otherwise. However, no matter how they work on the pipe, contractors still need to shut down that pipe as they do their jobs. With that line out of service, Sutherland, in the past, has explained water normally flowing through it needs to go somewhere. The result is fluctuations in pressure around the system, lines becoming overloaded. The result was the numerous water breaks that sprung up around Portsmouth, reducing pressure to business and residential customers alike and stirring up sediment in the pipes which sometimes led to discolored water reaching local taps. “We’re dealing underground with things we’ve never seen before,” Johnson said at one point. Regarding progress on the reservoir project, Sutherland said the next step is connecting a newly repaired pipe on Kinneys Lane with a pipe on Offnere Street. Contractors should complete that phase of the project next week barring any unforeseen problems, Sutherland added. After the new Kinneys Lane line is connected to Offnere, it will need to be hooked into a line on Sunrise. The city also plans to eventually replace the pump station on Sunrise. “I don’t think we’ll see a lot of effects, but water breaks are possible,” Sutherland admitted, regarding the continuation of the reservoir line work. He also noted water levels in the Sunrise reservoir undoubtedly will drop. In the past, both Sutherland and Johnson have noted the infrastructure being dealt with is in some cases 100 or more years old. Contractors have 180 days from the June 4 project start date to complete the work, which makes the contractual date for finishing the project Dec. 1. In the meantime, traffic closures and detours will continue in the project areas. 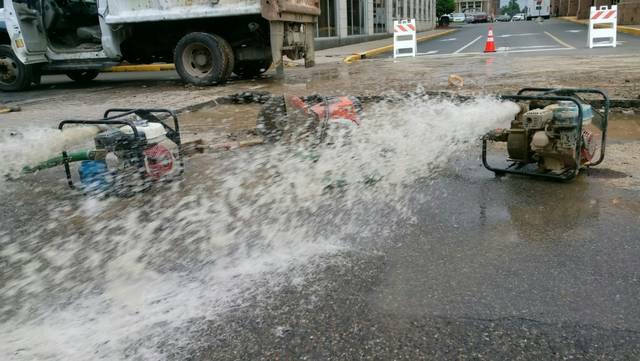 https://www.portsmouth-dailytimes.com/wp-content/uploads/sites/28/2018/08/web1_Water-Break1.jpgCity workers took on the task of repairing a water main on Chillicothe Street Tuesday. https://www.portsmouth-dailytimes.com/wp-content/uploads/sites/28/2018/08/web1_Water-Break-2.jpgPumps work to empty was from the hole city workers dug to repair a water main break on Chillicothe St., Tuesday.